Can a piece of plywood be squared using a table saw? 1. I have changed blades. 2. I have squared the fence to the blade. Turning the blade and checking with a micrometer as I went. 3. I have squared the miter to the blade. 4. I have squared the miter to the fence. 5. I have squared the blade to the table. 6. I have squared the fence to the table. 7. As far as I can tell, everything is square to everything else. 8. I have taken ¾” Sande plywood, making certain that the edge against the fence has no high spots or low spots. The plywood is perfectly flush against the fence. 8.1. I then run the plywood through the saw and check for parallel edges. The edges are parallel. 9. I place one of the parallel edges against the miter and run an end through the saw. 10. I take the other parallel edge and place it against the miter and run the opposite end through the saw and check for parallel ends. The ends are parallel. 11. The corners are not square. 11.1. Should the corners be square? 11.2. If not, how should I square the corners. TS miter gauges are hard to get truly square. Most people build a sled for cross cutting on the TS. Google William Eng for a good description on how to square a sled to your saw. William Ng method to get perfectly square cuts, using a cross cut sled. The method is called the 5 cut method. Another vote for using a cross-cut sled and for Ng 5-cut method for squaring it up. After building a couple of sleds (very large, and a medium size), I rarely use a miter gauge. Aside form having something that is more square, the cut line in the sled make it very easy to line up the cut mark on your work. It also functions like a zero clearance insert. And, since the wood doesn’t move relative to the sled, there’s no tendency to skew the wood as you push it through the saw. Sometimes with a miter gauge, you can inadvertently slide the wood sideways as you make the cut. Similar to this, is the fact that the wood doesn’t rub on the table top, so again, contributes to the wood moving straight through the blade. I think this can make for a cleaner cut with fewer blade marks. Bottom line, a cross cut sled is my #1 shop jig. What are the size of the components? I assume you have cut your parts square then tilted the blade on your saw to cut the miter? If you cutting the point on top and variation the in thickness of the board will cause what you describe. If the board rises off the table even a tiny bit in the center as the ends droop off the table surface that too will cause the center to be wider than the ends. I may not be visualizing what your describing correctly but a better more durable corner can be achieved a capped rabbit joint. Here are two versions, 1st is standard grade, 2nd is premium grade. You and I can do standard grade, however, to do premium grade you need a veneer press so you can lay the edge band under the veneer. Here are drawings of both. 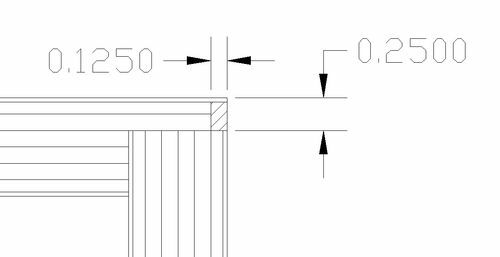 Step 10 is incorrect, keep the same edge against the miter gauge. Also you don’t say if the cut after step 9 is square. If not your miter gauge is not square or the wood is slipping during the cut. With four factory edges, I slice off what I need plus a bit — maybe an eight to a sixteenth of an inch. I then set the fence to precisely what I want and flip the board around and cut it. That way I have two perfect edges that are parallel. After that, I cross cut my parts from it. Getting a square cut is more challenging and you need either a good sled as mentioned above, a miter gauge that’s square, or a miter saw that’s set perfectly square. I use one or the other depending on various factors, but either will work if they are set up right. I tried the fence and miter gage method. About 65% of the time it would produce square corners but I need 100% of the time. I have an Incra 5000 sled system. I’m going to use the system square it up using the method described by William Ng. I want to thank everybody for their help. 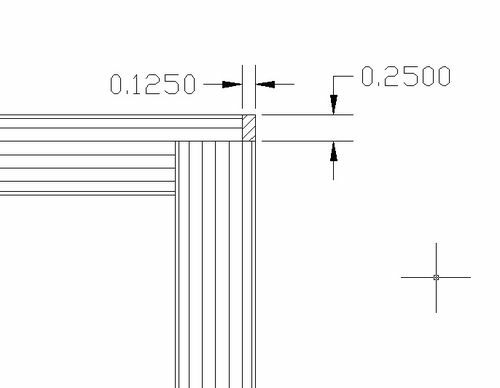 Miter gauges are dead simple to square but you need a known good square. After building a couple of sleds (very large, and a medium size), I rarely use a miter gauge. Aside form having something that is more square, the cut line in the sled make it very easy to line up the cut mark on your work. It also functions like a zero clearance insert. And, since the wood doesn t move relative to the sled, there s no tendency to skew the wood as you push it through the saw. Sometimes with a miter gauge, you can inadvertently slide the wood sideways as you make the cut. Similar to this, is the fact that the wood doesn t rub on the table top, so again, contributes to the wood moving straight through the blade. I think this can make for a cleaner cut with fewer blade marks. I agree. Since I made mine and stopped using a miter my accuracy has gone up greatly. Error is my fault for not paying attention to cut line or double checking measurements. With that awesome Incra 5000 and the five cut method, he’ll nail it. Guaranteed. I wouldn’t give up until you understand what mistake is being made with the miter gauge and know that you can use it correctly. I bought the saw used and I don’t think the miter gage was treated well. That happens, but if the wood is slipping, a simple fix like 220 sandpaper glued to the miter gauge face will help considerably. I attach an additional piece of wood to mine to increase the width, also covered in sandpaper. It extends past the blade and helps reduce tearout. I hold my square snug against the blade and slide the loosened gauge up to it then tighten it down. Dead on every time. Sleds are nice but sometimes I want to make a quick cut. I haven’t used the factory supplied miter gauge on a table saw in probably 10 or 20 years. I have an Incra precision miter gauge for odd angles but for right angle cuts I use a sled. The factory supplied miter gauge is too small and there is usually too much play between the miter slot and the gauge rail.